Build your own talent pipeline to address challenges like retention, talent development and employee engagement by using the proven model of Registered Apprenticeship. 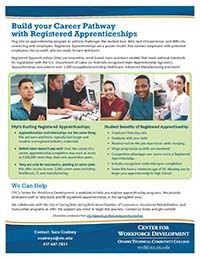 Registered Apprenticeships are innovative, work-based, earn-and-learn models that meet national standards for registration with the U.S. Department of Labor (or federally recognized State Apprenticeship Agencies). Apprenticeships now exist in over 1,000 occupations including Healthcare, Advanced Manufacturing and more! Structured on-the-job training to meet the needs of your specific business. Stable and predictable pipeline of skilled workers. Technical assistance and support, at no charge, from local, state, and federal workforce system partners. Industry-recognized credentials for your employees. Are you a student? Would you like to help build your career pathway with a Registered Apprenticeship? OTC’s Center for Workforce Development is available to help build your apprenticeship program. We provide dedicated-staff to help build apprenticeships in the Springfield area. Additionally, we offer technical and leadership training that combines with the on-the-job component of your apprenticeship. Use the contact information below and get started today! For more information, contact Sara Coatney by phone at 417-447-7831. MYTH: Registered Apprenticeships and internships are the same thing. MYTH: Registered Apprenticeships are only for mechanics or welding. MYTH: Registered Apprenticeships are too expensive. MYTH: All Registered Apprenticeships are union jobs. MYTH: Only non-educated or inexperienced individuals qualify for Registered Apprenticeships. REALITY: Apprentices can be new-hires OR businesses can select current employees to join an apprenticeship program. Current employees can receive credit for related experience or education. It’s also a good way to reward high-performing new employees and move them up the career ladder within your business! Read success stories at http://www.doleta.gov/OA/ new_sstories.cfm.